This year student editors of the Cardozo Journal of Conflict Resolution have chosen to honor former President Jimmy Carter with the International Advocate for Peace Award in recognition of his lifetime of work, from the historic Camp David Peace Accord between Israel and Egypt, to monitoring some 90 elections around the world and supporting fledgling democracies to resolve conflicts without violence. The Journal is recognized as one of the premier publications in the field of dispute resolution, and previous Peace Award recipients have included President Bill Clinton, Ambassador Richard Holbrooke, Senator George Mitchell, John Wallach and Seeds of Peace, playwright Eve Ensler, Archbishop Desmond Tutu, Betty Murungi, Ambassador Dennis Ross, and documentary filmmaker Abigail Disney, among others. The students have made this decision based on President Carter’s achievements, and we support their right to do so. It is more than just a mistake for a school that is associated with traditional Judaism and religious Zionism to give an award to Jimmy Carter, no matter what his achievements in conflict resolution. Carter is, simply, anti-Israel. As I noted, Carter’s double standards of how he whitewashes Hamas actions while characterizing Israel’s as “apartheid”, and his interceding to stop a Nazi war criminal from being deported from the US, may cross the line to indicate that Carter has a real problem with Jews altogether. 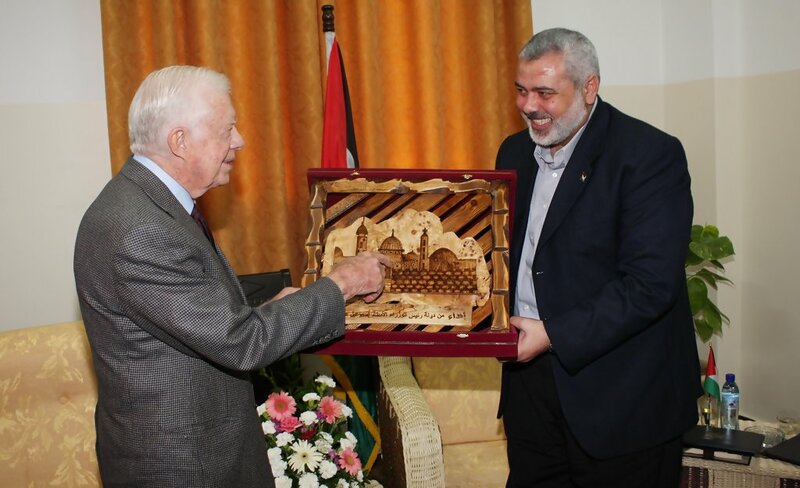 Beyond that, how can any Jewish institution stomach the idea of giving an award to this man, smiling as he receives a gift from a mass murderer, that symbolizes that Jews have no rights to their eternal capital? Will Congress restrict funding the PA for its ICC actions?